Have you joined the craziness? People were talking and I was feeling nostalgic, so I downloaded the app and tried it out... I didn't get it and thought it was dumb... or maybe it was because I couldn't get it to work, so I gave up! Until the next morning and tried it at the movie theater... A bucket of popcorn, soda, and a movie later; I walked out with 10 Pokemon and nearly 100 Pokeballs in my 'bag,' I was a Big Fan! The game has taken the world by storm! People of all ages, as young as 3 yrs old to 53yrs old are excited to get out and Play! 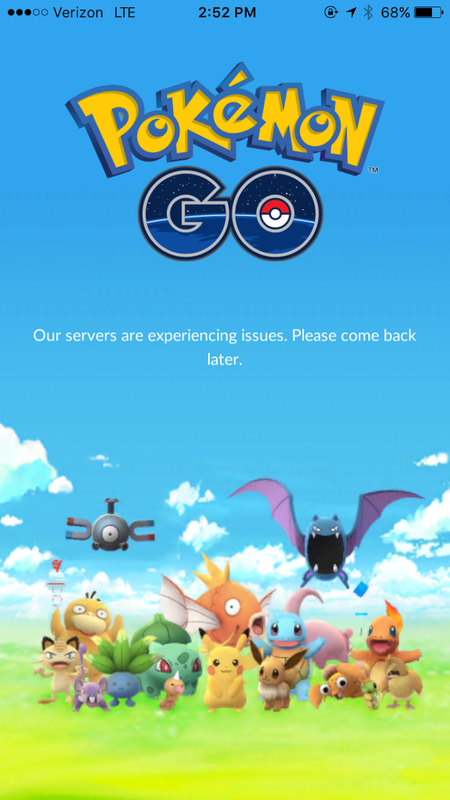 So many are playing, the creators weren't prepared for the overload of people playing it and sadly we have to deal with this dreaded screen of doom! 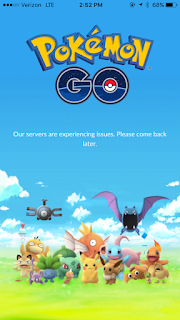 We honestly just want to cry when this screen pops up, Like Brock! It's tough when you catch the rare Pokemon and then the screen Freezes! On Tuesday, I blocked off the whole morning for a Walk in the Park, across the street from my neighborhood! It had been over a year since the last time I went for such a long walk. I need motivation and Music used to give that to me, but last year my MP3 player stopped working and I just couldn't replace it without spending a ridiculous amount of money! Pokemon Go is Free and motivated me to get out there! The Game encourages you to walk 5 and 2Ks to Hatch your PokeEggs into High Powered Pokemon! That's an Awesome Reward! It's another game, Kids will be so absorbed in the game they'll only see the screen and nothing around them! WRONG! In general, gamers stay in there rooms and play. They talk in forum online and speak with other players, teaming up, and beating the game together. These Gamers make great friends, but a lot of the time they are in other countries around the world! You might be in NYC, but your two best friends are in Germany and Singapore! Truth be told, you'll probably never meet them IRL. Pokemon GO gets you out of the house and sends you to local hotspots where groups of people gather together. They all have a common interest and even if you're shy, you're bound end up talking to someone! I'm rather shy when I first meet someone and I end up having the most lively conversation with people playing Pokemon GO! My brother met a couple of guys the other day at the park and is planning on meeting up with them next week on his day off. These are new friends, new people we meet and get to know and celebrate with! Socializing IRL is so much better than doing it online! Despite living in the area for 10+ yrs, we haven't really seen the whole place. I've only realized this since downloading Pokemon GO because in an area I thought was only private property, we found a public park! Pokemon Gyms and Pokestops can be found at local hotspots, parks, churches, museums, and public displays of art and sculptures. While yes, pokeballs and pokemon got us there, but now that were there it's time to admire, explore, and learn. I honestly wish the pokemon map in the app would allow a wider view then a one mile radius of my current location. There might be other places I'd want to go! #4) It's Creating an Economic Boost! 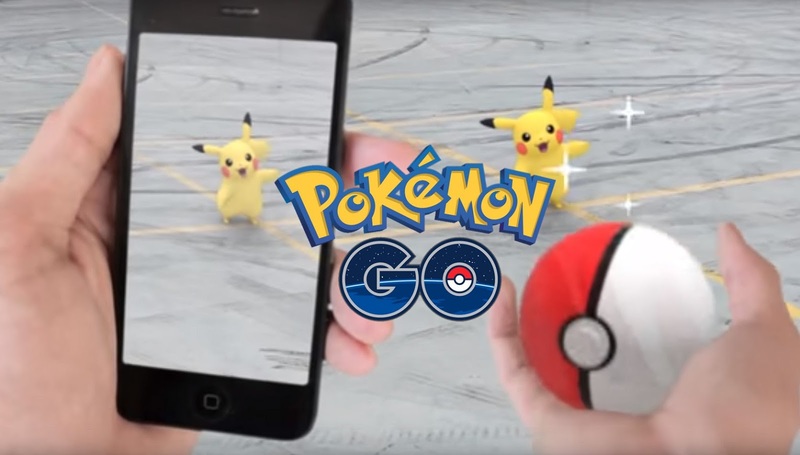 Thanks to the Pokemon GO App, more people are out and about, walking long distances and exploring new places. In doing these things, people find themselves at local businesses and restaurants when it's lunch or dinner time. After a long day of pokemon hunting it's easier to grab take out or sit down in a sub shop, than to go home and fix dinner. My other job is in a small shopping center and normally the summer is super slow. In the last two weeks, since Pokemon GO came out, we've had an increase of customers. Why? Because we have two Pokestops and a Gym in our shopping center. Kids and adults are hanging out to battle each other and collect pokeballs, berries, revives, and potions. It's hot outside, so they come in for some air-conditioning, and browse around; usually they buy at least one thing if not walk out with a whole cart full of products! The local cafe is opening an hour earlier to accommodate the influx of customers. The market is stocking more cold water than usual, and the deli just hired two new people to keep up with the sub and chicken tender orders. Did you know you can raise money and awareness for different causes just by walking? Almost every weekend you'll find a Charity 5K somewhere in your area! There are always walks for the Homeless, Walks for Cancer, Relay for Life and etc, but those sometimes cost you money to participate, unless you raise money around the neighborhood first. 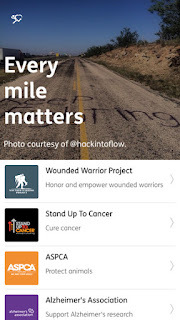 New Apps, that can run in the background while your walking and hunting for Pokemon, have been created that allows you to raise money for a cause without having to be in an organized event! 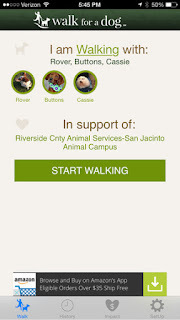 Walk for a Dog and Charity Miles are Apps you can run while you hunt for pokemon! It registers your steps and miles and once you hit certain goals, they pay money to an organization of your choice! Not only will you be hatching an egg, finding several pokemon, and winning a few battles after a 5K, but you'll also help those in need, from animal shelters to cancer research! Help do your part just by downloading the app and running it in the background! While it doesn't cure Depression, it has helped give those with depression a drive to get out of bed and get out into the world. Depression can be so crippling that it leaves you in bed and nothing in the world can get you to move. Most people remember Pokemon from our childhood, a happier time in our lives. More than likely it's a moment in time when depression didn't effect you; therefore, it's a simple joy that worms it's way through the chemical imbalance that causes depression. The person with depression that decides to play Pokemon GO will get up and get out! By getting up and out of the house, your leaving the glooming indoors behind and getting fresh air. Not only that, but exercise creates new chemicals in the body that helps alleviate Depression. 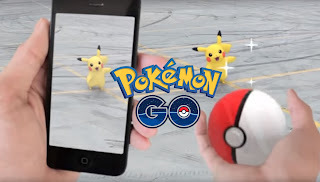 Playing Pokemon GO not only creates simple joys for anyone who plays but also gets the body moving creating happy endorphins that relieves stress. You are now walking out in the world on a regular basis, exploring new places by hunting Pokemon! If you cross a street, look both ways! If there's a crosswalk, use it! If there's a signal for walking, wait for it to say you can walk, but still LOOK BOTH WAYS! You're walking in the park, be aware of runners, cyclers, lakes, and roots! It's not the tree's fault you hit your head because you walked into it. It's not the lake's fault you fell in because you walked off the trail. It's not the car's fault you walked out into traffic. It's NOT the Game's Fault either! I pray and hope this game will slowly increase people's awareness of the things going on around them. I hope people will realize when they walk into someone private property, especially if they had to step over a fence with a sign that says just that. I hope people will be aware when they walk through an intersection or a bad part of town. Be aware and respectful if you go to a museum or cemetery. Be aware and move to the side of a busy walkway, instead of stopping in the middle and blocking everyone. If you move six inches to the side, I Promise you won't lose that Pokemon! 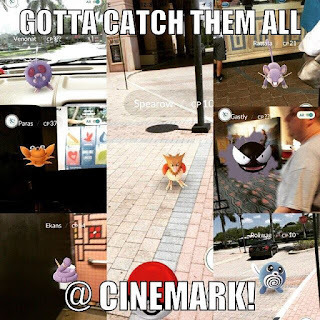 My movie theater is always packed with people, and now there's a ton of Pokemon too! I often go early to the movies now to catch Pokemon and stock up at the Pokestops. There's one spot by a pillar in the theater where I am in range for all three Pokestops, and the Pokemon just flock in! I become part of the pillar and catch 10 Pokemon in ten minutes! 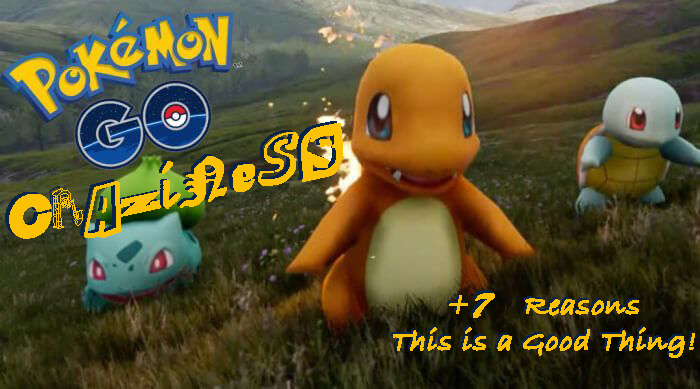 So yeah, here's my 7 Good Points that Pokemon GO is a GREAT Thing! I Love this App and I haven't even Battled anyone! Exploring my community and meeting new people and just getting some exercise has just been wonderful! What's your favorite part about Pokemon GO? What's you Favorite Pokemon you've Caught so far? If your a nay sayer, Why do you DisLike Pokemon GO?